Chef Shawana is Odawa, part of the Three Fires Confederacy. 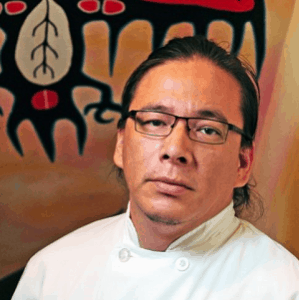 Born and raised in Wikwemikong Unceded Indian Reserve located on Manitoulin Island in Ontario, Joseph was brought up knowing that food is life. Having 6 brothers and 6 sisters, and being the oldest male, he paid a lot of attention to his mother while she was cooking, who she learned from his grandmother and great grandmother. Since starting in the kitchen when he was 13, he knew that the chef life was for him. He graduated with honours from culinary school, and everyday that passes his passion for food grows more and more. Trained in classical french, and with his Aboriginal background, he cooking infuses Classical French techniques with Native American Cuisine. Full of flavour and never compromising quality over quantity. Joseph started a program to help young youth to come into his kitchens and work alongside the chefs and teach them the culinary field in every aspect. Chef Joseph Shawana, the force behind a new high-end Indigenous restaurant in Toronto, where he experiments with traditional Indigenous ingredients, many of them wild, including fir tips, sweetgrass and seal.